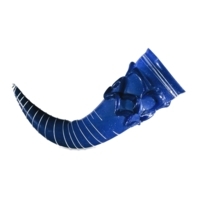 This blue-colored drinking horn, which possibly originated from Rome, is made out of glass. It is decorated with white circulating lines and lattice-work. “Sutri Drinking Horn,” Medieval London, accessed April 22, 2019, http://medievallondon.ace.fordham.edu/items/show/36.